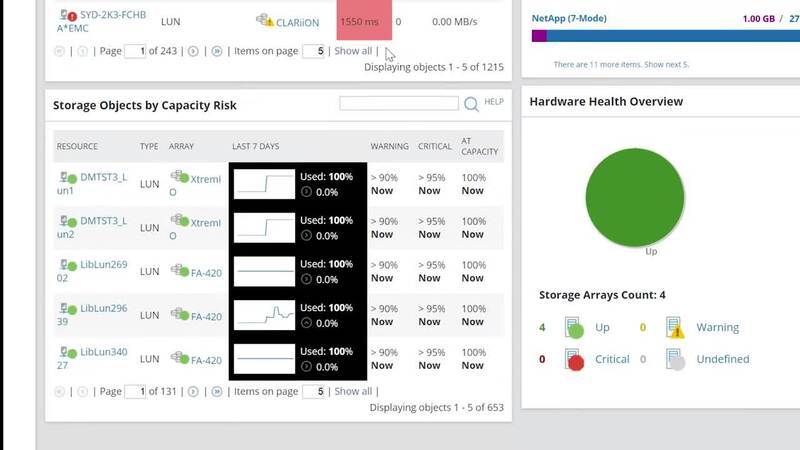 No need to move between multiple vendor tools to understand your overall storage status and health with comprehensive monitoring from Storage Resource Monitor (SRM). Gain valuable insight into storage utilization and capacity to help avoid failures and forecast future needs. See storage in the context of your application, virtualization, and server infrastructure for faster troubleshooting. Managing a mix of storage vendors is challenging because you have to rely on multiple tools to keep storage devices and systems functioning like they should. With a unified network storage monitoring tool, you can easily identify performance bottlenecks in your infrastructure and quickly take corrective actions. For example, you can receive alerts about response times that are slower than expected across different storage devices. Network storage monitoring software should track usage over time and allow you to create predefined and custom reports to see performance metrics and capacity trends in your storage environment. With SRM, you can generate out-of-the-box, web-based reports to see real-time performance data, such as server volumes, NAS volumes, LUNs, and storage pools by capacity—and have a forecasted view of when you’ll reach capacity. Performance bottlenecks in the storage environment can be a serious threat to application and data center performance. Manual capacity planning processes are inefficient and can lead to outages and inaccurate budgeting. If not addressed quickly, storage bottlenecks can disrupt the business by causing application downtime. Network storage monitoring software monitors the performance of your software-defined storage environment and helps you investigate and remediate any issues.